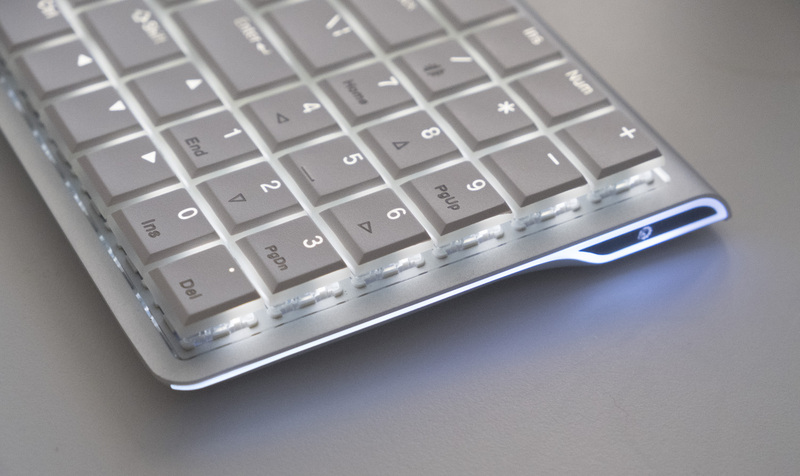 The Magic Keyboard is legendary amongst Apple fans — it’s light, stylish and even provides a decent typing experience, courtesy of some MacBook-style scissor switches. 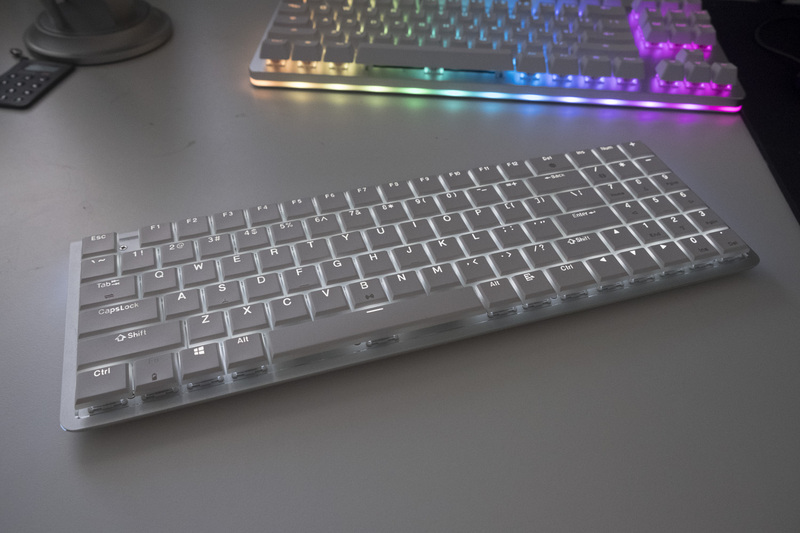 Today, I’m looking at a prospective replacement for the Magic Keyboard, a new mechanical keyboard from the experts at Drevo called the Joyeuse. This keyboard uses Cherry ML-style low profile mechanical switches, allowing it to maintain incredibly thin dimensions while still including plenty of tactile feedback and a bunch of LEDs too. Let’s put it to the test, and find out if it’s time to retire the Magic Keyboard! 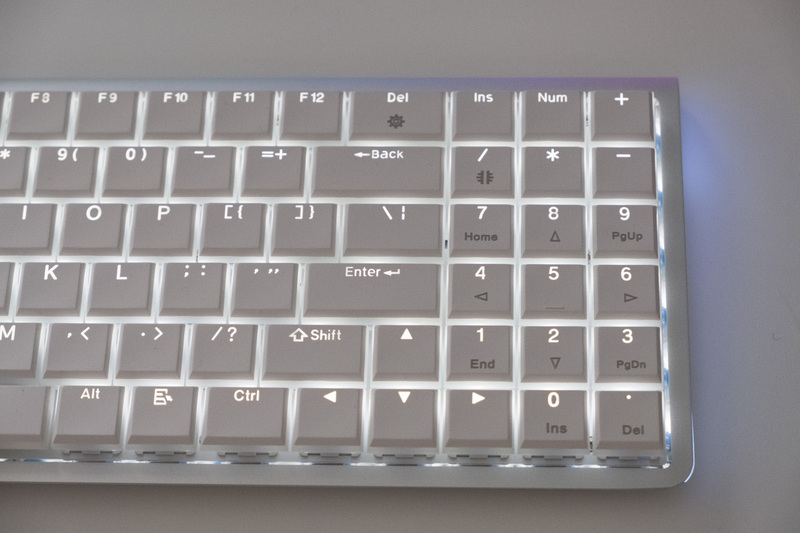 The Magic Keyboard vibes start immediately upon unboxing the Joyeuse; you get that familiar look of white keycaps above a silver aluminium body. However, the Magic Keyboard comes in tenkeyless and full-size varieties; here you get a mixture: 96 keys, about ten less than a full layout, with a numberpad squashed up against the alphanumerics. That makes this keyboard quite compact, without unduly sacrificing ease of use. This keyboard is thin. At just 21 millimetres, the Joyeuse is leagues apart from the usual mechanical keyboard fare, and it’s light at just over half a kilogram as well (just over a pound, for our American friends). Considering that this is a metal keyboard with a built-in Bluetooth transmitter and battery, that’s pretty impressive. The insanely slim dimensions are down to the inclusion of Drevo’s own low profile switches, which have a travel distance of just 3 millimetres. There are three options available here: blue clicky switches that actuate at 50 grams of force (which I’ve been testing), 45 gram red light linear switches and 60 gram black linear switches. 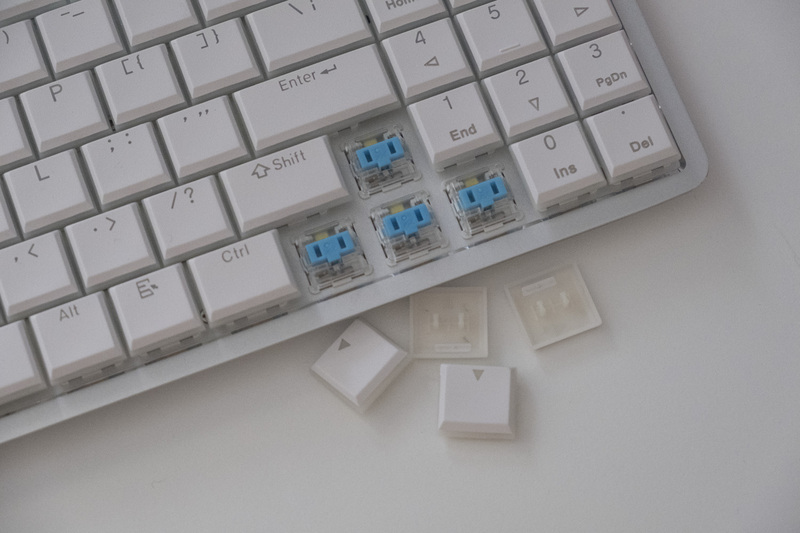 The clicky switches live up to their name with a lovely report as you get typing — you’re probably better off choosing one of the linear options if you want to use this in a quiet office! The keyboard comes with both key backlighting and side backlighting. (On our unit, the side lighting is RGB, but in retail units it will reportedly be white only). There are sixteen modes to flick through, including some that cascade around cinematically, while others respond to your touch with a flurry of movement. I ended up using the static ‘on’ mode, but it’s nice to shake things up once in a while. Our pre-production unit comes with a Micro USB port, but I’ve been assured that Drevo are swapping that out for a more advanced (and reversible!) USB-C port on all retail units. The first thing we noticed about the Joyeuse is that typing is a little less intuitive than we anticipated. The compact, almost cramped design makes it easy to hit the wrong key by mistake, while the short-throw switches amplify your mistakes. However, once you hit the groove and get used to the layout, you can type extremely rapidly indeed. This produces an absolute cacophony with the clicky switches we’re using, to the extent that we slowed down our typing on the train in order not to disturb other passengers! Once you’re alone, you can better appreciate the tactile and aural feedback that this keyboard provides. It’s certainly a better typing experience than the Magic Keyboard, and it may be a good introduction to mechanical keyboards for long-time Magic Keyboard fans. Apple’s keyboard was designed to look good, and the Joyeuse continues that tradition with a strikingly similar design. Where Drevo go further is in the inclusion of the side and key backlighting, which gives the keyboard a more modern feel. The printed legends on each keycap aren’t quite as nice as the Magic Keyboard, but with the backlighting they remain perfectly legible. We got a couple of nice comments regarding the Joyeuse, and we’re certain it would look good on any desk. USB-C charging is another nice inclusion. If you’ve got a modern high-end laptop or a recent Android smartphone, then you’ll likely already have a USB-C cable with you, so you don’t need to take another to charge your keyboard. The battery life isn’t fantastic with full backlighting, but if you dial it back a notch you shouldn’t have any problems lasting for a few days or even a week at a stretch. The portability and low weight of the Joyeuse also came in handy. We could carry this keyboard without really noticing it, something that isn’t possible with the average mechanical keyboard. 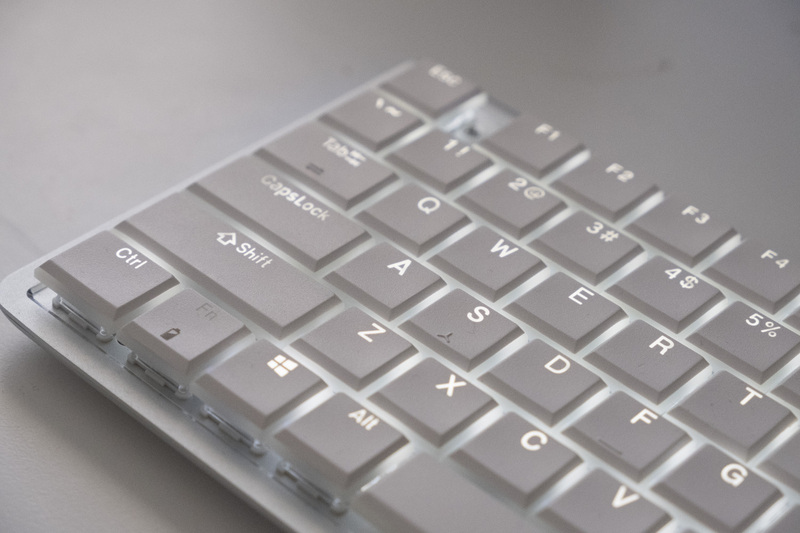 The compact layout means that it will even fit in some laptop bags, making it very easy to have an excellent typing experience whenever you need it. You can even use the Bluetooth mode with your phone, which is great if you have a few spare moments to work but don’t want to get your whole laptop setup out. However, we did find that the keycaps sometimes were levered off when we left the keyboard in the main pocket of our backpack, so it it is useful to use a smaller bag of some sort to keep everything in one piece. The Bluetooth functionality of the Joyeuse worked well. It’s not immediately clear, but you need to put the keyboard into Bluetooth mode by pressing Fn + Tab before you can pair with Fn + B. (If I were Drevo, I’d try to automatically start Bluetooth mode if the pairing key is tapped, but that’s just me.) Once I worked this out, pairing worked quickly and the keyboard maintained its connection without any issues. Ultimately, the Joyeuse is a success: a head-and-shoulders upgrade over the Magic Keyboard that provides a ton of mechanical keyboard goodness in a very compact package indeed. I’m still not entirely sold on the compact layout, but the clicky short-throw switches and beautiful design make it easy to look past this minor flaw. We had a great time using the Joyeuse, and we’re looking forward to seeing them go on sale this Christmas to see what other users think as well!